This month’s column recognizes not an iconic islander but rather an iconic business. A favorite of many during its 60 years, Vic’s Drive-In opened on June 28, 1958. Call it a Drive Inn or Drive-In, it’s always been Vic’s and the hamburgers have always been tops with all ages, from one generation to the next. Victor and Margaret Guard Reynolds had a good idea back in 1958 and backed it up with a modern design for a classic drive-in when they had the restaurant built on their Second Street property, next door to their home. The diner’s original design featured a walk-up window for ordering (indoor seating was added much later), with tables along the side of the building and in the back. The Reynolds owned Vic’s for twelve years, retiring in 1970 when they sold to Jack and Sharron Louthan. 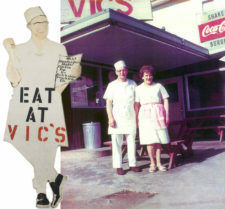 Some remodeling was done then and Vic’s re-opened under the management of Sharron’s parents, Virgil and Lucille Bryant. Kevin Widmayer and Linda Jensen bought Vic’s in 2000 and carried on the tradition of an American family-style menu and friendly service for the next sixteen years. Another tradition at Vic’s was the gathering of the Rusty Zipper Club, which met regularly for coffee, gossip, and tall tales. The club was so well-known that it was mentioned in a tribute to “charter member” Clyde Sundstrom at his 2006 memorial service. A new chapter in Vic’s history began in 2016 when Brian and Theresa Carlson became owners and now carry on its successful tradition of a classic American diner menu, served with a smile. The Carlsons invite all to its 60th Anniversary celebration this June 28. Happy 60th, Vic’s! Trish Harris and Mike Sharkey owned Vic’s before Kevin & Linda. They had it for several years. Thanks for posting this, Tim! A great way to gather historical information for the museum’s archives! The San Juan Historical Museum sends thanks all who comment. As Shaun said, this is a great way to gather information for the archives. Much of our local history has not been recorded and every addition to donated materials and recollections is a plus. And when it was owned by Glen Campbell, its name was changed to Driftwood Drive In. Now we have the Driftwood Drive-In connected to Glen Campbell. Thanks, Tim. Two more pieces of the jigsaw puzzle fit together! Word is first burger was bought by Pat McCutcheon and second by Skeeter Lowe. Thank you, Brian. This is the kind of detail that adds to a great local history story.